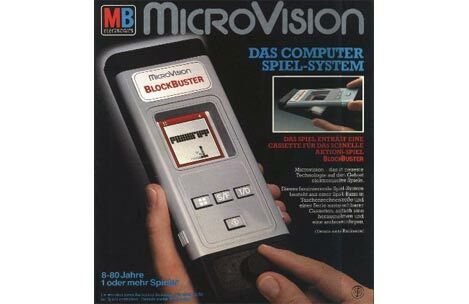 The MicroVision was released by Milton Bradley in 1979. It has the distinction of being the first cartridge-based handheld gaming unit with an LCD display. I'm happy to say that I spent a few minutes playing with one of these when I was a kid, because very few still work today. LCD technology was in its infancy in the late 1970s, and the MicroVision's crude 16 x 16 pixel monochrome LCD display suffers from screen rot, often resulting in a forever-darkened display, even if the rest of the unit works perfectly. The main unit was little more than a housing for the display, batteries, switches and knob controller -- the brains of each game was a combined microcontroller/memory chip inside the clip-on game cartridge itself. This enabled the manufacturer to use different microcontrollers depending on the complexity of the game, and MB used both the 4-bit TMS 1100 and 8-bit Signetics/Intel 8021. Each cart contained 2 KB ROM and 16 bytes of RAM (partitioned as 32 4-bit nibbles). The carts were extremely susceptible to damage from static discharge, making each cartridge swap a potential game of Russian Roulette. A total of 13 titles were released between 1979 and 1981, including the Block Buster pack-in cartridge. The MicroVision was a brilliant concept that was a few years ahead of technology, as Nintendo was to prove a decade later with the smash-hit Game Boy and Tetris. Trivia for those who stuck with me through this entire post: The MicroVision was designed by Jay Smith, who went on to design the astoundingly cool Vectrex game system.